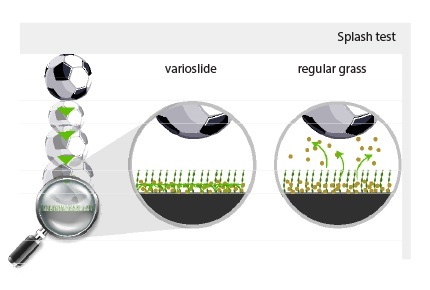 VarioSlide S PRO is a revolutionary type of grass with top-notch technical and playing properties. It uses the unique ‘Duo Yarn System’ patented by Domo® Sports Grass. This technology incorporates two different yarn varieties into one single glass product: the monofilament Heliflex yarn and a cross-linked monotape. This unique combination brings a number of additional benefits. 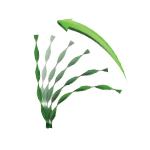 Heliflex TECHNOLOGY BUILT-IN RESILIENCE The Heliflex technology is designed with a spiral-shaped yarn to achieve an exceptionally resilient grass. As soon as pressure is exerted, the yarn experiences tension and will spring back upright. The ball rolls on the tips of the artificial grass fibres, guaranteeing excellent ball behaviour. The players have the feeling more than ever that they are playing on ideal natural grass. The HELIFLEX spiral-shaped fibres are always standing straight, which makes the infill slide more quickly and more easily in the grass. The monotape holds the infill in place, preventing it from being displaced during play and keeping the pitch nice and even. The tips of this film split, forming a perfect protective layer for the artificial grass infill. The “splash test” results carried out by LABOSPORT indicates Category 1, the best result achievable. 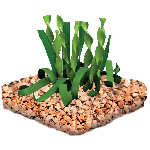 Looks just like natural grass: VarioSlide has a very beautiful and natural appearance. The integration of the extra monotape gives the grass a luxurious look. The shades of green of the fibres are inspired by natural colours. MAINTENANCE Vario Slide requires regular brushing. Topping up with rubber and sweeping are limited by the monotape net that holds the infill in place and keeps it level during brushing, or when clearing the snow from a pitch.